About four years ago I started having symptoms that seemed weird for someone in their late 20’s. and I generally didn’t feel good. At first I thought nothing of it. I assumed I was just feeling the exhaustion of being a parent to a newly running baby. I blamed my aches on a lumpy mattress and carrying around my daughter. I finally went to the doctor after my husband convinced me in late 2014. Many X-Rays were done and a full set of blood work was done also. A week later I got the call I was not wanting. For the first week or so I was mostly in shock. I didn’t want to even think about it. At 31 I wasn’t ready to hear any of this. It’s funny when you are 16, 31 seems old, but when you’re 31 you realize you’ve really just started life. The next week I became very depressed. I was heart broken and feeling hopeless. I have spent my entire life against pharmaceuticals. I have never liked the idea of taking medicines that cause as many side effects as the disease they treat, but there I was taking 6 new medicines. I used to be the chick who hiked the Appalachian Trail. The mom who took her kids camping, gardened, and spent all my time outside. Yet here I was unable to do any of that fun stuff. Most of that stuff was long gone because I had been in pain, but I finally had answers so it was time to pick myself up and get that back! 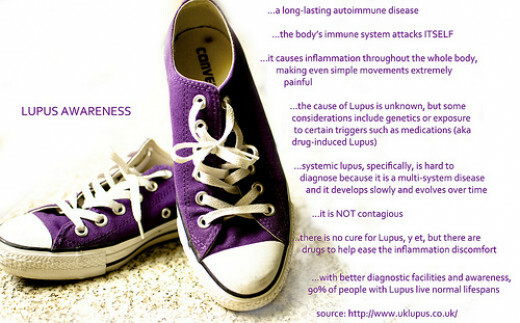 There are many steps in dealing with Lupus. I will list some in the order I find most important. Take some time to accept that you have a life altering disease. In a sense you need to grieve the you that you lost. You need to accept that there will be many changes. Cry, get angry, talk to a loved one. Do whatever you need to do to feel better. It is hard for many people to understand why someone who looks completely normal claims to be sick. Lupus often has no visible symptoms. You now fit into something called chronic invisible illness. Make sure you explain your symptoms. Doing this will help them understand your pain and forgetfulness. Learn as much as you can about your disease. Read about what different medicines do. Read about what foods are best. Read about which doctors have the best reviews. Read about ways to deal with the pain. Research alternative therapies and complementary therapies that might help. Research EVERYTHING!! Knowledge IS power. After reading the reviews, pick the doctor who seems to have the best reviews. Go for a consultation, but if you don’t like them keep searching. You have to be comfortable with your doctor. And it is incredibly important to feel like your doctor is on your side and fighting for you. There are many support groups online these days. I prefer Facebook groups because they give a bit more privacy, and I can show up even in my PJ’s. Some people with Lupus change parts of their diet and find some relief when eating the right foods. Research the foods that are best to be avoided and see if eliminating them will help you. Don’t make too many changes too quickly though. Those of us diagnosed with lupus need to remember our bodies are stressed and fragile. So avoid any dramatic changes. Of course you’re going to listen to your doctor. But this is also a time to listen to others who are diagnosed with Lupus. What can you learn from their experience? What do they do that helps relieve or address symptoms? Do they get the greatest help from drugs, or from other treatment types? Natural remedies and alternative therapies are not a fix for everyone, but they are a fix for some. So alternative therapies are worth considering. Getting diagnosed with Lupus is rough. So take some time to be great to yourself. Do things that help you forget about the diagnosis ~ even if just briefly! Through a lot of my time since being diagnosed with all of this, I have leaned on my iMom to vent. She has been a wonderful ear. iMom has advice on some options outside of normal pharmaceuticals that hopefully one day she can share with all of you. We all know nothing fits for everyone, but when you are popping a handful of drugs daily, more natural options are worth a try.